The pleasure of Phineas and Ferb is that it's a TV show for kids that never forgets parents enjoy it too. Heck, I watch it and don't even have children at home. On the surface, the antics of two clever and resourceful half brothers who go on wild summertime adventures, aggravate their sister, and take care of a pet platypus that's really a secret agent, is just goofy, wholesome fun. That the show is full of enough puns and pop-culture references to keep adults entertained is a bonus. Such is the joy of Phineas and Ferb The Movie: Across the 2nd Dimension, the Disney Channel Original Movie now available on DVD. In it, the boys crash a giant shuttlecock (just another day for them) into the evil lair of Dr. Doofenshmirtz and begin an adventure that takes them to "a brand new reality, a particle duality, a new dimensionality" where nothing is like what it was at home. 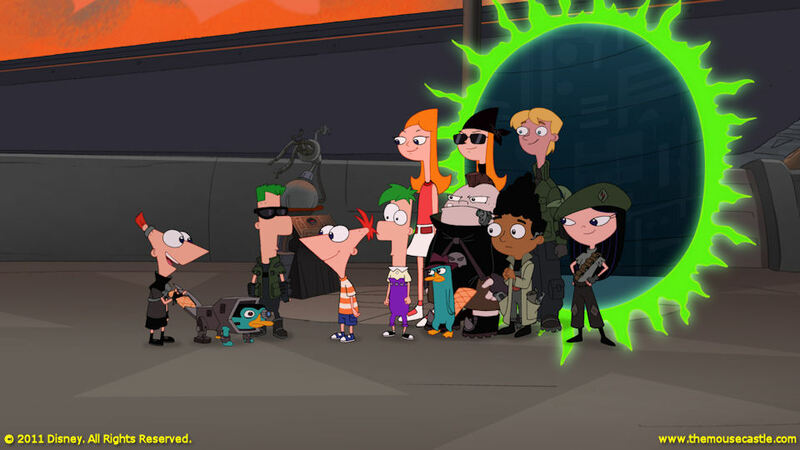 In this parallel universe, Phineas and Ferb discover the true identity of their platypus pet Perry and join forces with their other-dimension sister Candace, who turns out to be the leader of a resistance movement against a truly evil Dr. Doofenshmirtz, who has plans of his own not only to rule his own dimension, but Phineas and Ferb's as well. Movie and TV references abound, some obvious, others a bit more subtle. Keep your eyes and ears peeled for takes on Star Wars, Star Trek, Raiders of the Lost Ark and even The Jeffersons, The Honeymooners and Laverne & Shirley. Some of these moments may be lost on small kids, so be prepared when they stare at you, wondering what's so funny. Oh, and on the way, don't forget to enjoy the muffin-serving Norm-bots and the furry-vicious Goozim monster. They're fun too. Plus, your DVD comes with a kit to build your own Platypult. It's cool! Deep down in my soul, I'm 12, OK? A few years ago, Disney decided (mercifully) to stop producing direct-to-video sequels and prequels to its classic animated films (well, sort of, if you count the relentless Tinker Bell/Fairies franchise). This has not stopped Disney, however, from re-releasing select titles from the days Michael Eisner ruled the kingdom. For the most part, the DisneyToon movies made in the 1990s and 2000s were cheap imitations of their originals, with flat animation and heavy-handed "message" story lines. They were cheaply made cash cows that diluted the Disney brand and damaged the reputation of Disney animation. A few films, however, did stand out from the crowd with a higher degree of artistry and story telling than their Toon brethren. Bambi II was one of them. That's not to say that Bambi II (awkward title--it's working title was the far superior The Great Prince of the Forest) ranks among the classics of Disney animation. It doesn't. But it does have a serviceable story and some lush and very lovely background animation. It looks particularly good in its latest Blu-ray release. The story is what I guess you'd call a "midquel." It actually occurs during the original Bambi, after Bambi's mother is shot (oops, sorry, was that a spoiler?) and before the animals reappear in the spring. Bambi is on his own, save for his father, the Great Prince of the Forest (voiced by Patrick Stewart in a nice bit of casting). 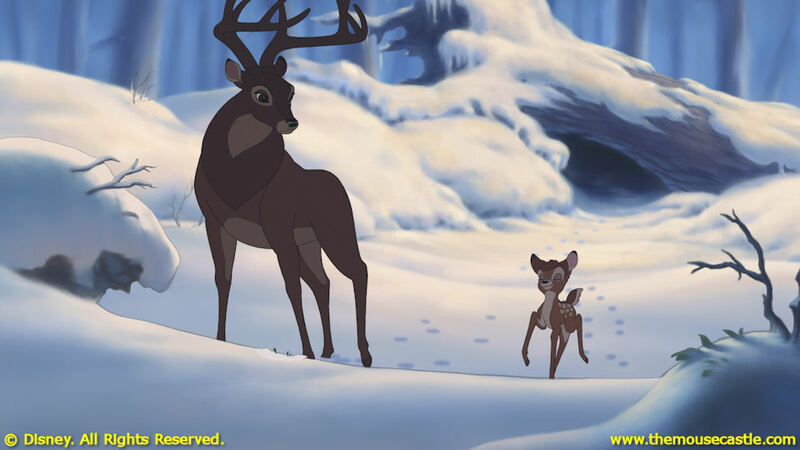 Bambi's father is not accustomed to the responsibilities of motherhood. He's a serious "big picture" guy, accomplished in looking out for the safety of the herd, but uncomfortable with raising a rambunctious fawn one-on-one. Can he and his son form a bond and, together, survive the harsh winter? The story is predictable and sappy--Bambi learns responsibility; dad lightens up--but it's told with a respect for the characters that's endearing (enDEARing, get it?). The movie climaxes with a suspenseful and tightly-edited chase scene involving Bambi and a pack of vicious hunting dogs. It's really well done, especially for a DisneyToon entry. 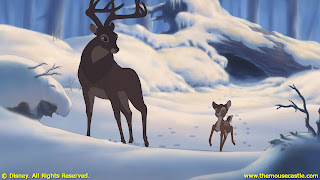 I'm sure you have your own opinion about whether or not classic Disney animated films should have been followed-up on or retooled, but Bambi II does stand on its own as a good--not great--chapter in the Disney animated canon. At least it's not as egregious as The Lion King 3D. (sigh) I couldn't bring myself to attend the screening of The Lion King 3D during the D23 Expo. If you read my blog, you know why. I did, however, agree to see a sneak preview of the movie in 3D Blu-ray on the Expo floor. I'm happy to report the Blu-ray transfer is fantastic, with stunning color and excellent sound. The 3D, however, is freaking annoying. 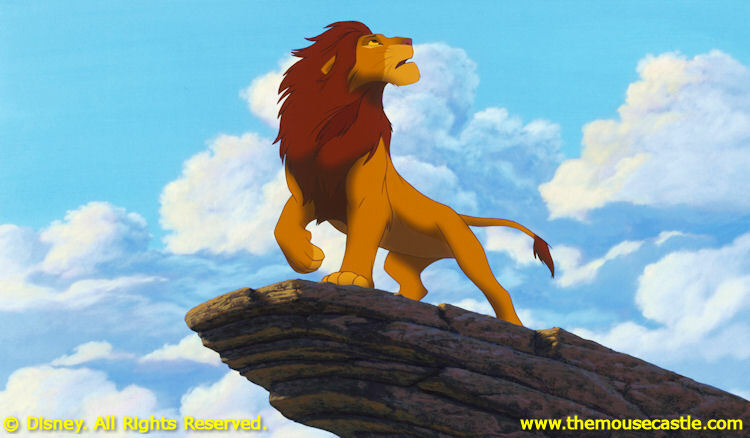 The Lion King is one of Disney's great film achievements. Produced by Don Hahn and co-directed by Roger Allers and Rob Minkoff, with songs by Elton John and Tim Rice, it was Disney at the top of its game during its 1990s animation renaissance. But The Lion King is, was and always will be a 2D motion picture. Viewing the opening "Circle of Life" number in 3D illustrates the problem with the conversion. While it was kind of fun seeing Zazu float in front of my eyes as he glided up to Pride Rock, the rest of the scene involved so many quick cuts and focus shifts among the animals in the Pride Lands (which worked terrific in 2D), the 3D became a jarring distraction. I was watching a series of effects, not enjoying a classic animated film. I'm afraid the opening four minutes was about all I could take. The Lion King 3D will open in select theaters on September 16, followed by a Blu-ray 2D and 3D release on October 4. I'll be sticking with the 2D, thank you very much. Pixar's underrated Cars 2 comes to home video on November 1. Lightning McQueen and Mater's foray into international espionage will be released on Blu-ray Combo Pack, Blu-ray 3D, Movie Download and DVD. Disney will also release an 11-Disc Combo Pack that includes both Cars movies--plus a collection of Mater's Tall Tales short cartoons--packaged together on Blu-ray, DVD and Digital Copy. 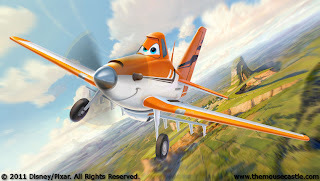 Three and a Half Men's Jon Cryer will provide the voice of Dusty, a small crop duster with big ambitions in DisneyToon Studios' Planes, due out in spring 2013. Inspired by the Cars franchise, Jon Lasseter will produce this direct-to-video release that will take the movies' hero on a "Wings Around the Globe Rally" to pursue his lifelong dream. Thanks Amy! I'm glad you enjoyed it.